Citrus Olive Oil Sampler for sale. Buy online at Zingerman's Mail Order. Gourmet Gifts. Food Gifts. Expand your olive oil world without cleaning out your wallet. And she's right. These are some of the best citrus oils I've ever tasted. They're great drizzled on anything off the grill, added to a vinaigrette or lavished on roasted vegetables. Asparagus with a bead line of orange oil is a personal favorite. You can even fit a bottle in your back pocket. Take it to a party where a grill is in action. You might catch a few odd looks when you bring it out. Never mind. They’re just jealous. And they're about to be astounded by the madness of this brand of Italian barbecue sauce. 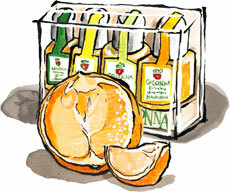 Sampler contains orange, lemon, bergamot and mandarin extra virgin olive oils. Note: the clementine and sampler at right are drawn to scale. We also sell larger bottles of the Lemon and Bergamot Olive Oils.